High drama in Parnell Park this afternoon. A late David Nestor save from a Craig Rogers penalty ensured Kilmacud Crokes’ place in the Leinster club SFC on Decemember 9th against Mullinalaghta and consigned Portlaoise to an eight successive loss to Dublin opposition in provincial combat. 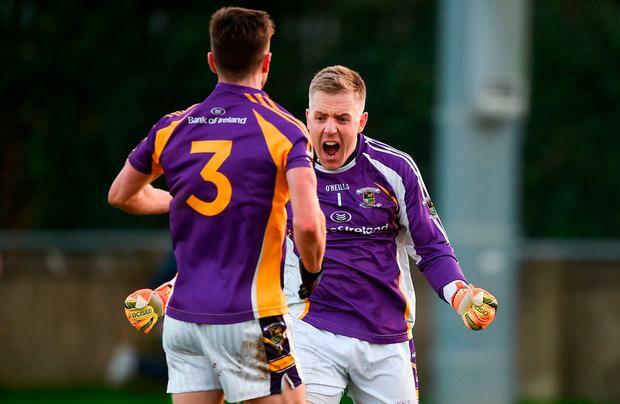 Crokes were worthy winners in a brilliant contest and will go into the Leinster final as huge favourites but Portlaoise’s three goals kept them in it, despite their inability to kick on after any of the strikes. The game started at a storming pace. Portlaoise went man-to-man all over the park, leaving their back six vulnerable to the pace of the Crokes attacking sextet. After 15 minutes, five of those Kilmacud forwards had scored from play, with a policy of running at their men at every available opportunity very clearly evident. Calum Pearson was the pick of that bunch in the half with 0-3 from play but Dara Mullin wasn’t far behind. The young Crokes forward scored a peach of a goal after just five minutes, accelerating past two Portlaoise defenders before daintily rounding Graham Brody and tapping home. The devotion to attack from both teams was reflected in the number of viable goal chances in the half. Brody made a magnificent save late in the half to deny Mullin his second goal while Paul Mannion blazed over the bar with his right foot while the Laois ‘keeper was prone on the ground. At the other end, David Nestor made one spectacular block from a Kieran Lillis shot, although he was culpable for Portlaoise’s second goal, a cool Paul Cahillane finish after a botched kick-out. Crokes went in three points up but Portlaoise’s nine wind-propelled wides suggested they should have been closer. The teams traded points early in the second half, with Crokes seemingly able to find their scores more easily but the dynamic of the match changed completely in the 47th minute. Just 10 minutes after coming on, former Laois forward Craig Rogers took a pass on the loop and squeezed a shot inside Nestor to level the match. In what was a recurring theme in the match, however, Portlaoise failed to follow-up on their goal. Indeed Crokes kicked the next three points, the pick of which being the third from the outstanding Andrew McGowan to put Crokes three clear with 58 minutes played. The game’s most dramatic moment came on the strokes of 60. Cian O’Sullivan coughed up possession after collecting a short kick-out and a looped pass across the Crokes square forced substitute Aidan Jones to haul Scott Lawless down. Rogers stepped up to take the penalty that might have forced extra-time but Nestor pulled off an outstanding save high to his right hand side and Crokes cleared to safety.